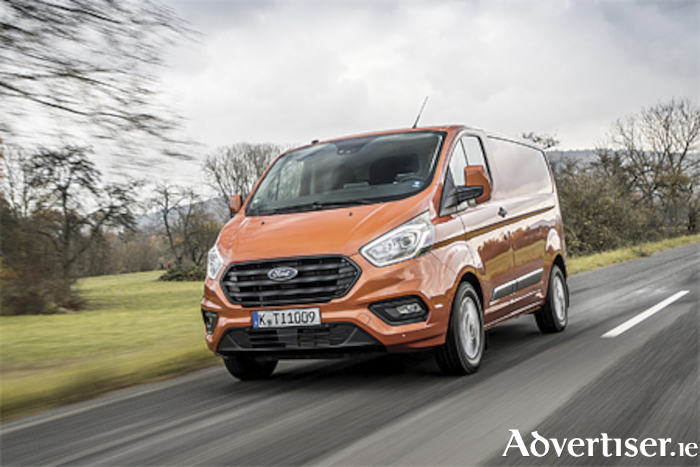 The new Ford Transit Custom one tonne van goes on sale here with an entry level price of €25,115 for the ‘Base’ specification level Van 280 L1, powered by the 2.0 litre 105PS EcoBlue diesel and married to a six speed manual gearbox. It delivers a bolder new design, an all new interior and Ford says it also offers enhanced productivity to businesses. The new range will be available in four series (Van and Double Cab-In-Van ) - ‘Base’, ‘Trend’, ‘Limited’ and ‘Sport Van’. Standard specification details on the ‘Base’ van are as follows - rake and reach steering adjustment, electric front windows, remote central locking with deadlocks, passenger side sliding load door with track cover, two 12 volt powerpoints, DIN/ISO compliant metal bulkhead with load through hatch (van only with dual passenger ), roll stability control, side wind mitigation and full size spare wheel. The ‘Trend’ is the next specification level up, followed by the ‘Limited’ and then the top of the range ‘Sport Van’. Powered by the game-changing Ford EcoBlue 2.0 litre diesel engine, Transit Custom has been re-engineered to offer significant new features and capabilities including a new ECOnetic van variant delivering claimed improved fuel efficiency and a claimed 148 g/km CO2 emissions. The new Ford EcoBlue 2.0 litre powertrain will come with a range of outputs: 105PS; 130PS and 170PS. The new Transit Custom builds on the success of the outgoing model, which became the top selling van in its segment across Europe since 2015. Sporting a bold new front-end design with three bar Transit grille, Ford’s one tonne van provides drivers with the ideal mobile office environment, featuring a completely new cabin that offers best-in-class stowage, improved comfort and ergonomics, and easy connectivity with SYNC 3 or MyFord Dock options. Further technologies introduced to commercial vehicles for the first time include Intelligent Speed Assist. The new generation Transit Custom sets the scene for Ford’s next major commercial vehicle innovation, with the introduction of the zero emission capable Plug-in Hybrid (PHEV ) derivative scheduled to begin volume production in 2019. The Transit Custom PHEV utilises an advanced hybrid system that targets a zero-emission range exceeding 50 kilometres and features the multi award winning Ford EcoBoost 1.0 litre petrol engine as a range extender.